Available for Etesia Hydro 124 models, for the safe removal of moss and weeds without the use of chemicals. If you have weeds, algae or moss on your surface then prevention is preferable and regular sweeping will help to achieve this. The ten-brush MBR 124 gives users an environmentally-friendly alternative to using harmful chemicals. Ideal for use on block paving and tarmac, the 500mm diameter brushes with a working width of 150mm can be simply adjusted to tackle the most stubborn infestation. The brush attachment is fully adjustable for height and angle to facilitate a wide variety of tasks and surfaces. It may also be used for maintaining surfaces to prevent the growth of moss. Etesia has always been at the forefront of green innovation. That is why today, to better respond to new legislation on the safe use of chemicals, the company embarked on the development of an ecological accessory. 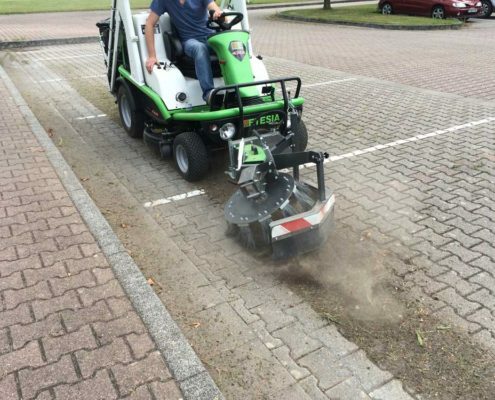 Areas of use include: Driveways, car parks, paths and walk ways, roads and industrial parks. The brush attachment is compatible with Etesia’s Hydro 124 DN and Hydro 124 DX machines. This accessory also gives more versatility of the machine by expanding its accessories range. The wire brush is assembled and disassembled easily at the front of the machine, without changes to be made in advance. Other accessories available include a mechanical spreader, sprayer, blower, sweepers, and side brush.